The segmentation of compartments allows to analyze their morphology (size, shape, intensity, position in the cell) and their position compared with other compartments. The following figure illustrates the position of compartments in cells plated into micropatterns. Three cellular compartments are separately segmented: centrosomes, Golgi apparatus and nuclei. The figure A shows every compartment and its segmentation. The figure B shows the distributions of compartments in the space (centrosome in green, Golgi in red and nuclei in blue). 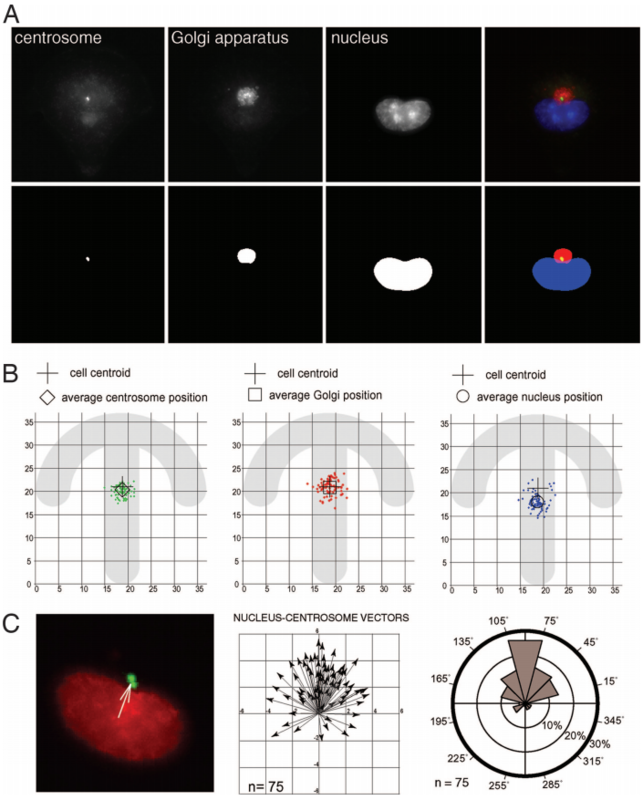 The figure C represents vectors nuclei – centrosomes and their directions. Reference : Anisotropy of cell adhesive microenvironment governs cell internal organization and orientation of polarity.Théry M, Racine V, Piel M, Pépin A, Dimitrov A, Chen Y, Sibarita JB, Bornens M. Proc Natl Acad Sci U S A, 103(52):19771-6, 2006.